Meeting at The Masonic Hall, Oxford Street, Marlborough, Wiltshire. 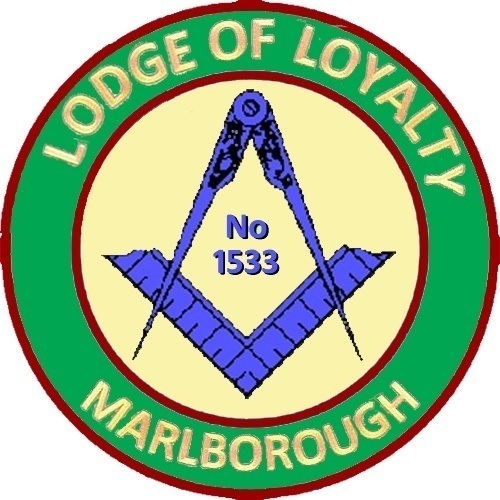 On 6th November 2018 at the Masonic Hall in Marlborough, the Lodge of Loyalty No.1533 Initiated Mr Louie Altoveros into Freemasonry. 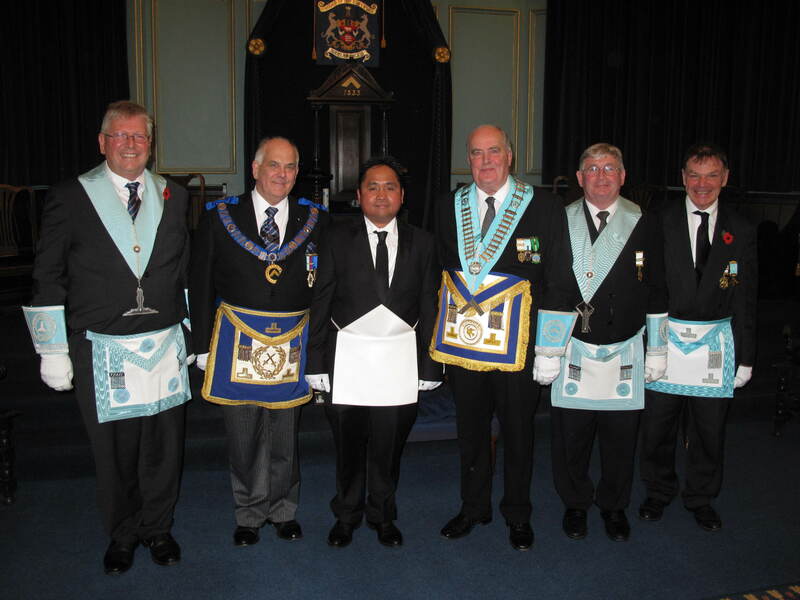 Louie, a Philippine national, contacted the Province via our website to inquire about joining Freemasonry. Knowing that English was not the first language for Louie, the Lodge went about rehearsing the Initiation Ceremony so that it was delivered much slower than normal. The Deputy Provincial Grand Master VWBro David Davies who was in attendance, congratulated the Lodge on the very high standard of ritual by all the Lodge Officers and said that it was clear that everyone had put a lot of effort in learning and delivering their respective parts. After the meeting the Deputy PGM joined Bro Louie, the Worshipful Master, Wardens and Junior Deacon for a photocall. The evening was rounded off with a lovely festive board and a sizeable amount of money was raised from a super raffle for the Royal British Legion. RW Bro Francis Wakem QPM. PPrGM - It should not be denied that the beauty; the heart contained ‘within the perishable frame of this Masonic Hall’ can only have come from the Members who have crossed the threshold today and the shadows of those who have entered the Hall over the years. In a previous role I often posed the question - "what do we know about the names on the several Lodge and Chapter Boards; do we know who they are and equally importantly, what part they played in our social history while never forgetting those members who did not progress to the Master’s Chair?" How apt it is that tonight we honour a Brother whose name appears on the Past Masters Honours Board and whose father had been Lodge Secretary for many years in the 1950s and 1960s. Brethren I refer to WBro Roderick James Hunt MBE. I recall commenting that the greatest pleasure for a PrGM – and for the sake of regularity a PPrGM - is the opportunity to acknowledge long and faithful service to Freemasonry. Such a celebration is a very special moment - a very emotional experience for the member concerned and particularly for the members of his Lodge. It is an occasion when the names on the Past Master’s Boards for the respective Lodges and Chapters come alive as real people – not just names from many years past. I will talk in a moment about Roderick’s spare time activities but for now I would like to mention just two important Masonic Papers Roderick has researched and produced. The first entitled a History of St Edmund Lodge No. 6451 Province of Berkshire, and secondly a history of Freemasonry in Marlborough. Important as they are to Masonic archives, I have to report they achieved nothing like the success of Roderick's more popular works. But let me also add a little 'colour' to Roderick's first inclinations towards Freemasonry. At the incredibly young age of eleven years following a visit to view this Masonic Hall where his father was Lodge Secretary - Rod asked his father a question - "when could I become a Freemason?" Despite his early interest and clear aspiration it was not until 12 March 1965 having attained the age of 25 years that he was Inititiated into this the - Lodge of Loyalty No. 1533. It will come as no surprise to know that he progressed through the Lodge offices and was Installed as Worshipful Master on 3 May 1978. Having become a Freemason, Roderick's zeal was clear to see a Joining Member of the Wiltshire Masters’ Lodge No. 6731; Isis Lodge No. 4242 Oxfordshire; St Edmund Lodge No. 6451 Berkshire where he was Installed as Master in 1997 and subsequently served as Lodge Secretary; Blakeney Lodge No. 6679 Norfolk; and University Lodge of Chester No. 4477 Cheshire. Roderick was Exalted in the Supreme Degree of the Holy Royal Arch in Isis Chapter No. 4242 in 1981 and later became a Joining Member of Abbey Chapter No. 945 Berkshire and Installed as Most Excellent Zerubbabel in 2002. I am sure that everyone is delighted that many members from your Masonic past are in attendance. Roderick's support for Pure Antient Masonry – Craft and Holy Royal Arch – was recognised in 1984 with Appointment as PrGPursuivant in Wiltshire; PPrGReg Berkshire in 1993; PPrAGDC Oxfordshire in 1998; PPrJGW Berkshire in 2003 and in 2010 I had the privilege and great joy of promoting you to PPrJGW. As if that wasn't enough in 2005 in the Holy Royal Arch you were Appointed as PPrAGSoj in Berkshire. Clearly you must have spent a small fortune on Masonic Aprons! Now to what Roderick got up to in his spare time, and this alone leaves me quite breathless but with a great regard for both his intellectual and physical capacity. A teacher for 19 years; and a Children’s Author for over 40 years, my research suggest he has written over 600 books and is the creative mind behind those well loved characters Biff, Chip, Kipper, Floppy and their friends. Roderick's work has featured on BBC television and radio. Roderick a Patron of the NSPCC, a Fellow of the Royal Society of Arts and a Fellow of the English Association. In 2008 Her Majesty The Queen acknowledged his lifetime of work and service to education and in particular literacy by Appointing you a Member of the Most Excellent Order of the British Empire; and in 2009 together with a colleague won the prestigious BESA (British Educational Suppliers Association) Outstanding Achievement Award for Educational Resources. In 2015 you were awarded the inaugural Outstanding Achievement Award by “What Kids are Reading Awards” sponsored by Renaissance Learning. Roderick, just in case there was any doubt in your mind I am sure you will agree that the evidence of the high esteem in which you are held by your family; friends; business and Masonic colleagues is plain to see. Brethren throughout my decade as PrGM I regularly used the words Live Well; Laugh Often; Love Much … words often wrongly attributed to Robert Louis Stevenson. I also express my confidence that we will continue to practice the 3Fs in Freemasonry - friendship, fun and fulfilment ... words wrongly attributed to Francis Wakem … for these words were actually composed by Roderick Hunt following a visit I made to a Lodge at which Roderick was also in attendance. Brother Roderick Hunt - your enthusiasm and support for Pure Antient Masonry – and for the wonderful and precious gift of life in general is quite outstanding. I am sure all those present - would agree with these sentiments. As Hannibal Smith used to say on the ‘A Team’ … “I love it when a plan comes together” … Roderick your plan to lead an extraordinary life has done just that. I am delighted to have the opportunity of presenting you with the Provincial Grand Master’s Certificate of Achievement - as a token – to mark this wonderful anniversary of 50 years faithful service to Freemasonry.